First of all, please measure your dog's neck and select the size range. You can also add extra filters such as design, closure or price. If you fail to find the match you need, it means such item is out of stock. Please search for different combinations. 20 - 25 cm / 8 - 10"
25 - 30 cm / 10 - 12"
30 - 35 cm / 12 - 14"
35 - 40 cm / 14 - 16"
40 - 45 cm / 16 - 18"
45 - 50 cm / 18 - 20"
50 - 55 cm / 20 - 22"
55 - 60 cm / 22 - 24"
60 - 65 cm / 24 - 26"
65 - 70 cm / 26 - 28"
There are no products based on the combination of preferences you have selected. Please filter the catalog using a different set of features. Amber is a fossilized tree resin which contains aromatic chemicals called terpenes which effervesce when amber is heated or rubbed and produce a resinous aroma. Nevertheless, electrical charge is generated due to friction that is created when amber stone is rubbed against the fur. These two (aroma and electrostatic) properties help effectively cope with parasites such as ticks and fleas. 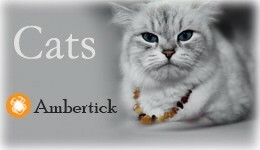 Ambertick© - Natural amber necklaces for dogs and cats.